The Tackle House Contact Feed Popper 120, is a 30gram, 12cm, floating popper lure that has been designed to target in-shore tuna. 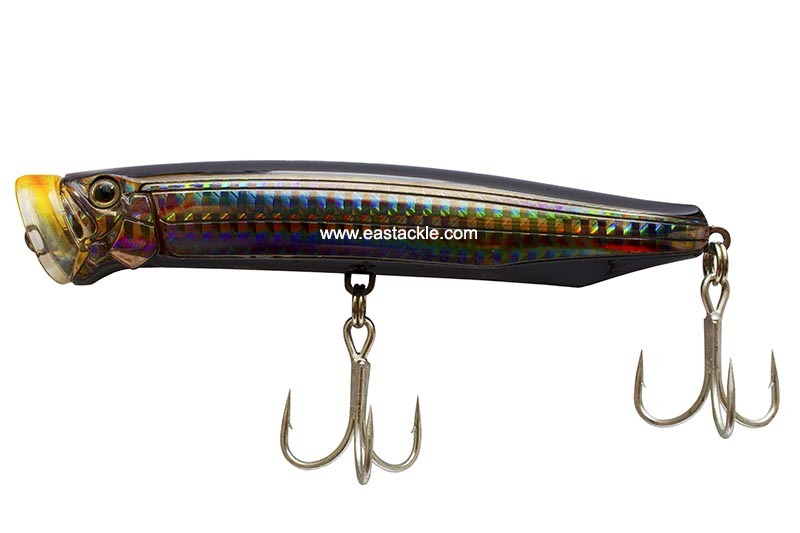 This lure comes with 3 rear weight balancers that are held individually in an “egg crate type” housing that permits a bit of free play motion to accentuate the lures rolling action whilst producing its rattling sound. This top-water lure, with its oversized asymmetric cupped face, when retrieved, will push water and produce it characteristic chugging and popping sound. When retrieving is paused, the lure rises quickly, with its cup face breaking the surface, ready for it to be chugged again. However, it is in those moments during each pause that the lure is most deadly to its intended target. At 30grams, the Contact Feed Popper 120 will cast easily without tumble, making it ideal for anglers to cast into schooling tuna that boil to the surface as they feed on anchovies.